It's no secret that multi-platinum hard rockers DROWNING POOL support our troops in a big way. Today, the band heads out on their fifth USO tour to perform and visit with service members stationed at Andersen Air Force Base (April 6, Guam), Kadena Air Base (April 8, Japan) and Camp Foster (April 9, Japan). This particular visit is in conjunction with the USO's Campaign to Connect. Whether inviting service members to an album release party or donating proceeds from album sales to the USO, DROWNING POOL is always there to support the men and women of our military, who protect us. 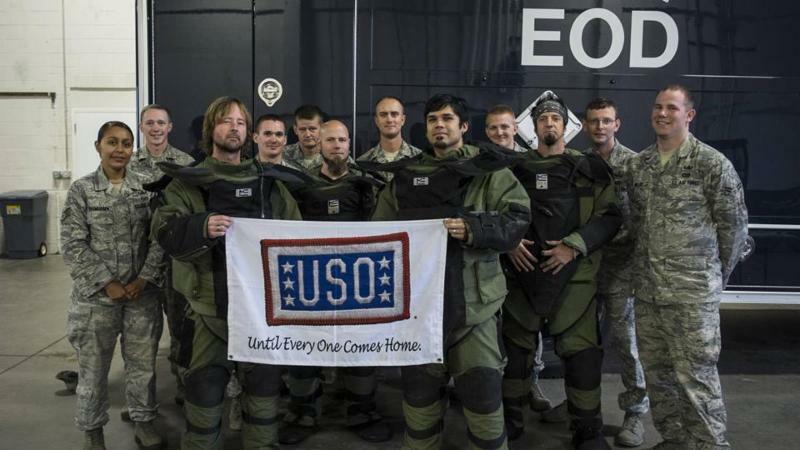 DROWNING POOL has volunteered with the USO for 11 years and has incredibly strong family ties to the military. Guitarist C.J. Pierce's father-in-law served in the Navy, bassist Stevie Benton's father is a Vietnam veteran and drummer Mike Luce's brother currently serves. As a result of those personal connections, the band has entertained more than tens of thousands of service members on 14 military bases in five countries, to date. DROWNING POOL has traveled with the USO, performing to troops in the U.S., the U.K., Germany, Iraq and Kuwait. Guitarist C.J. Pierce states, "We love giving back, it's the least we can do. ... There are a lot of families involved in the armed forces and we love giving them a hand. It's definitely great for us to go overseas and play at different bases. I think 2005 was our first one (Iraq and Kuwait) and it's personal for us. Each one of us has someone in our family somewhere in the armed forces and it's all about those friends and families." This year marks the USO's 75th anniversary and the official kickoff of not only a yearlong celebration around the world, but also the USO's Campaign to Connect, a new digital message platform designed to show appreciation to those who serve. DROWNING POOL joins the USO in its mission of connection and commitment to strengthening America's service members by keeping them connected to family, home and country. Visit www.uso.org/connects to learn how you can join DROWNING POOL as they help the USO deliver more than 1 million messages of support to service members and their families worldwide. The USO strengthens America's military service members by keeping them connected to family, home and country throughout their service to the nation. At hundreds of locations worldwide, we are united in our commitment to connect our service members and their families through countless acts of caring, comfort and support. The USO is a private, non-profit organization, not a government agency. Our programs, services and entertainment tours are made possible by the American people, support of our corporate partners and the dedication of our volunteers and staff. In addition to individual donors and corporate sponsors, the USO is supported by President's Circle Partners: AT &T, the BNSF Railway Foundation, Clark Construction Group, LLC, The Coca-Cola Company, Johnson & Johnson, Kroger, NFL and Four-Star Partners: BIC, ConAgra Foods, FedEx, GEICO, JCPenney, Lockheed Martin, Microsoft, Procter & Gamble, Starbucks, TKS and the Wawa Foundation. We are also supported through the United Way and Combined Federal Campaign (CFC-11381). To join us in this important mission, and to learn more about the USO, please visit uso.org.